Similar to Windows Task Manager, Ubuntu offers a system monitoring utility that will display running processes, memory usage, file system usage. Apart from monitoring, you can also take several actions from the system monitor user interface — such as killing a running process. 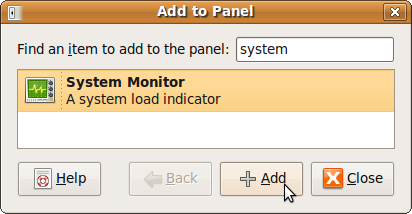 In this article, let us review how to put the basic monitoring options right on the task bar panel on Ubuntu desktop. Right click on the task bar panel and click on ‘Add to Panel’ as shown below. Search for the term “system” -> select “System Monitor” and -> click on “Add” as shown below. By default this will only add the processes usage graph as shown below. Right mouse click on the Processes graph that is displayed on the task bar panel, and select ‘Preferences’. Select the following check-boxes under the ‘Monitored Resources’ section. You can also choose Network, or Swap Space if you like to monitor those. By default it displays the memory usage in green, cache in light green, process usage in blue, load average in red. You can change the colors, and the refresh interval. 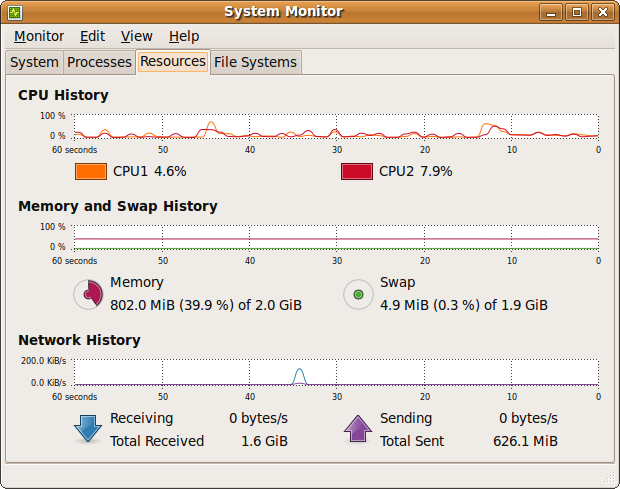 After the above selection, you’ll see 4 graphs in the Ubuntu task bar itself as shown below. 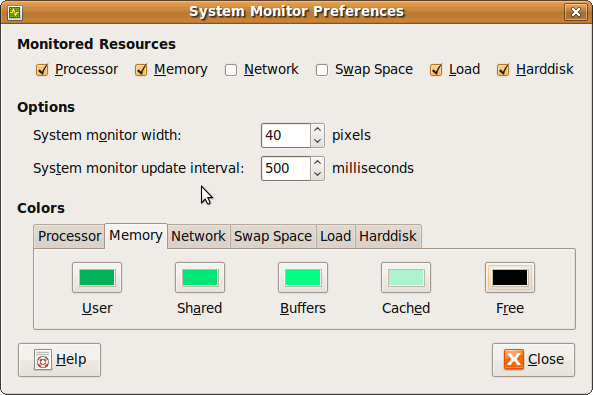 To view the system monitor in a bigger window, right click on any one of the system monitor graphs in the task bar, and click on “Open System Monitor”, which will display the System monitor in the bigger window as shown below. From the Processes tab, you can view all the process along with their status, %CPU usage, memory used by the process etc., You can also kill a process directly from here. The file systems tab displays the disk usages. The resources tab displays last 60 seconds of data in three different graphs for CPU, Memory and Network. Actually, it’s the GNOME project that provides this tool. Ubuntu simply packages GNOME as part of it default release. 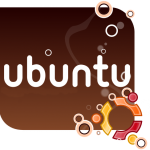 Other releases of Ubuntu such as Kubuntu and Xubuntu which don’t include GNOME, will also not include this tool. Thanks for clarifying that this tools is available as part of GNOME and not available on other releases of Ubuntu. Great list. I was having problems with firefox using a ton of memory and using these came in very handy. Thanks. 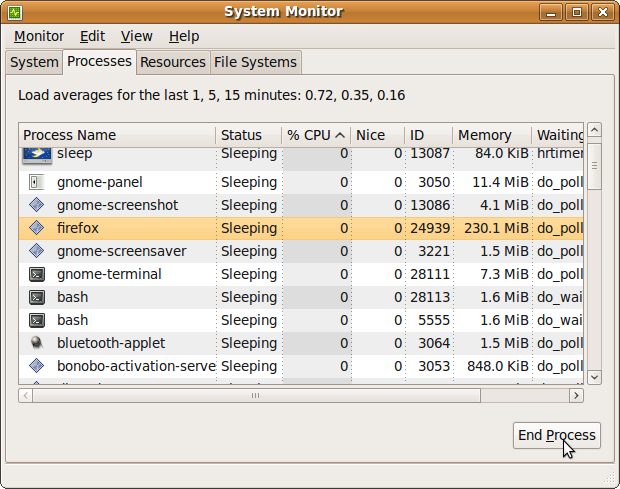 The Gnome System Monitor itself uses way too much CPU time. While they’ve taken some steps to resolve this, I’ll still take htop over GSM any day. What does the ‘load’ graph represent? I am very disappointed at the route Ubuntu has taken in the last couple of years. They seem to have neglected performance optimizations and the OS has become a huge memory hog.